Angel Bumps, Hello From Heaven has a Facebook page. If you’ve had a sign from Heaven from a loved one, here’s a place you can share it with others. 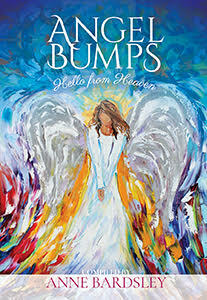 The stories of signs in Angel Bumps are getting wonderful reviews. In just a short time, the contributor’s stories are helping people talk about their grief. Join our community with your experiences and let’s support some folks through a very difficult time. There are some people who haven’t received a sign yet. Your story gives them hope and peace until their Angel Bump appears. I’m imagining a gathering in Heaven of people discussing sending more signs. Of course, there will be a leader of this angelic group to keep everyone in line. The ones who were ornery on earth can still be a handful in Heaven. I hope they are pondering the best possible sign to get our attention here. Joe: Mary keeps missing the Cardinals I’m sending her. She knows I love baseball. I’ve sent her baseball schedules of their games. She misses it. Group suggestion: Joe, try sending her a Cardinal, the bird. She’ll get that one. Gladys: My daughter thinks I forgot her. I watch her in tears and I want her to know I’m alright. She can be happy. Group suggestion: Send her a whiff of your signature perfume. Bobby: I keep leaving my old bike where Mommy can trip over it, but I don’t think it’s making her happy. Group suggestion: Send her one of the pictures you made for her….the one with big hearts. Bobby: Oh! That will definitely make her happy. Welcome to the family of Angel Bumps!